I am in the midst of 6 weeks of healthier living. Not a detox or a diet, just 6 weeks of fewer over indulgences. After the run up to Christmas, Christmas & fun filled Summer I just felt the need for a little less. When I say not a detox or a diet, the programme I am on involves exercise, lots of water & no processed food & no one food group is excluded & that is why it works for me. So I can still have my caffeine hit in the morning, fruit for snacks & pasta can still be on the menu for dinner Not really too different to what I would normally do, just a little less food, oh & did I mention no alcohol. Once a year I just like to know that I can do a little abstinence! Each to their own, but this is the programme that works for me. However, the last time I did it I wasn’t writing a food blog. I have a box of recipes to choose from & most of them are tasty, satisfying home cooked meals but not really what I blog about, not new delights I have discovered. As with most recipes I always feel the need to experiment a little, or add a little more of one thing a little less of another to suit my own taste & I still wanted to be blogging about food that I really, really enjoy. One of my go to snacks is crackers with a little guacamole, full of fresh bright flavours it can satisfy my taste buds & keep me going until lunch or dinner & down a the Clevedon Farmers Markets I spotted tomatillos & got quite excited. I was just going to make salsa but a browsing through Rick Bayless Mexican Kitchen I came across this Tomatillo Guacamole & knew it would be just the ticket for an afternoon snack, tangy & spicy to waken up body & mind in the midst of an afternoon lull. In a nutshell a roasted tomatillo salsa is stirred through the guacamole to give it a little extra kick. And to liven up a streak or fish try some Roasted Tomatillo Chipotle Salsa, fat free I can slather it on any of my meals to give them fresh, vibrant, smokey chipotle hit. Perfect for healthy living! It would of course be quite delightful with a pile of tortilla chips, but those will have to wait for another day. If you aren’t familiar with tomatillos, they look like pale green tomatoes (In Mexico they are called tomate verde just to add to the confusion) in a papery husk. They are a lot more tangy than tomatoes. Place the tomatillos on a baking tray & place under a hot grill. Grill them until blistered & a little blackened, turning to grill on all sides. It will take 10-15 minutes. Remove fro the grill & allow to cool. While the tomatillos are grilling roast the chilli & garlic. Place them on an unoiled griddle pan or skillet over a medium heat, turning occasionally until a little blackened & soft. The chilli will take 5-10 minutes & the garlic about 15. Remove from the heat & cool. Remove the stem from the chilli & peel the garlic. Place the tomatillos, garlic & chilli in the bowl of a food processor & pulse to a coarse puree. Place the puree in a small bowl. Rinse the onion & add to the puree along with the coriander & stir to combine. Cut the avocados in half & scoop out the flesh & place it in a medium sized bowl & roughly mash with the back of a fork. Stir in the salsa, taste & season with salt. Cover with cling & let it chill for an hour or so before serving. Tip: the salsa can be made ahead of time, up to 2 days. Just don’t add the onion & coriander until about to use. The finished guacamole will keep, covered & chilled in the fridge for up to 5 hours. This will be perfect as a snack for the next couple of days or perhaps a top a little steak for tonight’s dinner. Place an un-oiled griddle pan or skillet over a medium heat. If using the dried chillies break off the stems & then toast them for a few moments. Lay them on the skillet & press down with a spatula until they crackle a little & you can smell their wonderful smokey aroma. Turn them over & toast the other side & then place them in a small bowl & cover with hot water. Leave them to rehydrate for 30 minutes. Stir every now & then to ensure that they soak evenly & then remove from the water. The water can be discarded. If using the canned chillies no toasting required just remove them from the adobo. Next toast the unpeeled garlic in the the griddle pan over a medium heat turning occasionally until blackened & softened, about 15 minutes. Cool & peel. To make the salsa place the tomatillos, chillies & garlic in to a food processor & whizz until you have a smooth-ish paste. Place in a serving bowl & stir in a little water, about 3-4 tablespoons just to make a spoonable consistency. Taste & season with salt & the sugar. Tip: The finished salsa will keep for about 1 week in the fridge, but flavours will be brightest the first 24 hours. This spicy little salsa will be spicing up my meals this week. Not only packing a little heat it is a little tangy & also has that wonderful smokiness from using chipotles & not to forget a little mellow nutty sweetness from the roasted garlic. Summer means ice cream & I was lucky enough to get some damsons fresh from the lovely Arfi’s orchard, along with all sorts of plums. Damsons are such a wonderful fruit. A deep dusky indigo come inky blue when picked & then they turn jewel like when cooked, golden flesh & an almost deep cerise juice. A pleasant change from other fruits & veg that when cooked lose their vibrant hues. They are best cooked as they can be somewhat tart straight from the tree. However when cooked their plummy flavour intensifies, deep & sweet with just a hint of tart. They will make wonderful crumbles & crisps or great jams & jellies to brighten the cooler months with a little reminder of late lazy sunny Summer afternoons. Damson Ice Cream, from Nigel Slater’s Tender, a veritable plethora of the most delicious fruitiness. Rinse the damsons & place them in a saucepan with the water & bring them to a boil. Lower the heat & let them simmer for 10 minutes until the skins have burst & there is a fair amount of vibrant purple juice. Remove from the heat & sieve the fruit through a fine sieve. Use a wooden spoon to to press through all the fruit & juice until just the stones remain. Set aside the puree & let it cool. Place the egg yolks & sugar in the bowl of a food processor & mix until pale & creamy. Place the cream in a small pot & heat until just before boiling point, remove from the heat & drizzle over the egg & sugar mixture with processor still running. Have a basin filled with cold water to hand. Place the custard in a clean saucepan & warm over a gentle heat, stirring all the time until the custard thickens & coats the back of a spoon. Be careful here as if the mixture heats too much the custard can curdle. * Once the custard has thickened place the saucepan in the basin of cold water to stop it cooking further & to cool. Once cooled mix the custard with the damson puree & the yoghurt. Pour the mixture in to an ice cream maker & churn until almost frozen. Place in plastic container & freeze until ready to serve. Remove from the freezer 10-15 minutes before serving. *If it does all is not lost. Place the saucepan in basin of cold water & whisk like crazy & you should be able to save it! 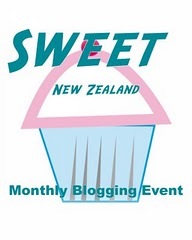 This is also my entry for Sweet New Zealand being hosted by Michelle over at Greedy Bread. Summer Vegetables with Pesto & Tapenade & a Little Haggis! The 25th January is Burns Night, a celebration of the poetry of Robert Burns & a good excuse to get a few friends together. I also love making people try & come to love haggis! Like most things the good stuff is very good & the not so good stuff not so good. Sadly one year a grumpy customs official confiscated the haggis from Mum & Dad at the airport on arrival in Auckland & we were forced to try a Kiwi version of haggis that year. Bar the first mouthful it all ended up in the trash. Suffice to say inedible, though that really doesn’t begin to cover it however that is not a topic to explore on a food blog! The first Burns’ Suppers were held in Ayrshire at the end of the 18th century by Burns’ friends on the anniversary of his death, actually the 21st July. Since then they have become a regular occurence on his birthday the 25th January. And the traditional food, well that would be where the haggis comes in alongside mashed neeps* & tatties*. It is the perfect fare for the middle of winter in Scotland, not so much for balmy summer evenings in Auckland. So for out Kiwi Burns’ Supper we just have the haggis as a little entree to the main event & honour the tradition of addressing the haggis, spearing it with a knife & shot of whisky. The only thing missing would be the piper piping in the haggis. What do have though is Dad & a recital of Tam O’Shanter, one of Burns best know poems. Even more amazing we get the general gist without really understanding a word!! You really want the freshest possible vegetables to make this dish sing. Summer Vegetables with Pesto & Tapenade from Tom Kitchin's From Nature to Plate. Peel the carrots & cut them in to thin, long strips. Cut the cucumber in to similar sized strips & cut the radishes in half. If using baby fennel cut them in to long lengths or if using one regular sized fennel cut it in to slices. Trim & peel the asparagus & then place all the vegetables on a plate & cover with a clean moist tea towel to keep them fresh. For the pesto; place the garlic, pine nuts & 1 tablespoon of olive oil in a food processor & blitz together. Add the basil & parmesan & with the processor running drizzle in the rest of the olive oil. Chill until ready to serve. For the tapenade; place all the ingredients in a blender & blitz until you have an almost smooth paste. Taste & season with salt & pepper & chill in the fridge until you are ready to serve. To serve arrange the vegetables on a platter with a little bowl each of the pesto & tapenade. And then, well just tuck in. Perfect on a balmy summer evening with a little glass of something chilled. The pesto is bright & fresh, the fragrant basil the essence of summer. The tapenade is full of flavour thanks to the capers & anchovies. It is savoury & a little salty, the perfect companion for the fresh vegetables.